What do Vincent Van Gogh, Roger Moore, elephants and typefonts have in common? The answer is…Hackford Road – this street has a rich and varied history. Hackford Road is mainly residential, it runs north to south and is crossed by Caldwell Street and Hillyard Street. 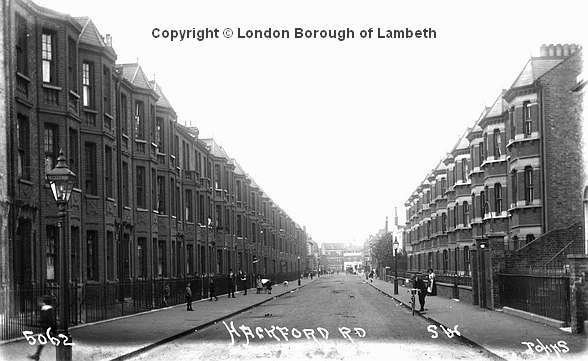 Hackford Road stands where there was once open countryside and in historical documents is often referred to as part of Stockwell. 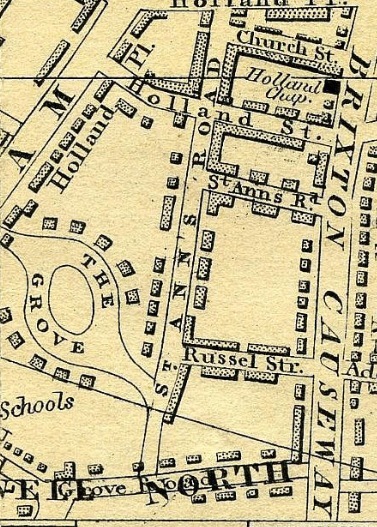 Hackford Road was originally called St Ann’s Road, it is unclear exactly when the name was changed but from looking at maps it seems that it was in the 1860’s. The first appearance of residents was in the building of small houses and shops at the north end of the street in the 1820’s, none of these buildings remain but can be seen below. Above – The north eastern side of Hackford road in 1909. These houses stood where Cleveland House and part of the Caldwell Gardens estate now stand. 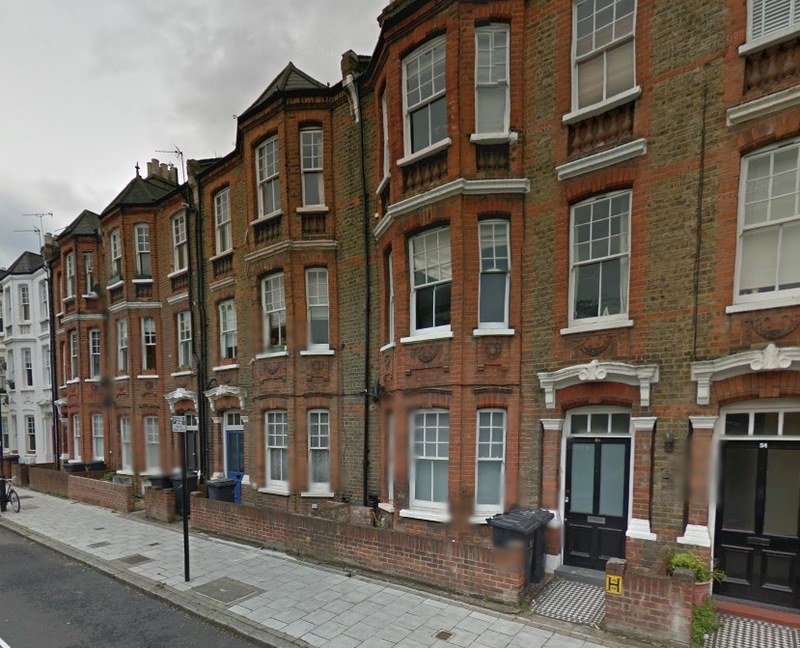 From examining Kelly’s Street Directories spanning 1870 to 1910, electoral rolls and the 1871, 1881, 1891 and 1901 Census I think that the terrace on the west side of Hackford Road (see photo above) was built in the 1870’s as houses, not as purpose built flats as with many streets in the area. The terrace first appears on records in the late 1870’s and retains mostly the same tenants and the same house numbers until the late 1890’s. There is a change at some point between 1898 and 1901 as by the Census of 1901 all tenants that had previously been living in the terrace were gone. The numbering of the terrace changes too, going from what had been 44, 46, 48 etc to 44a, 44b, 44c and so on, clearly indicating flats. I think that the terrace of houses was converted into flats, very unusual for the late Victorian period but possibly done as the owner of the street realised that there was more money to be made from flats. 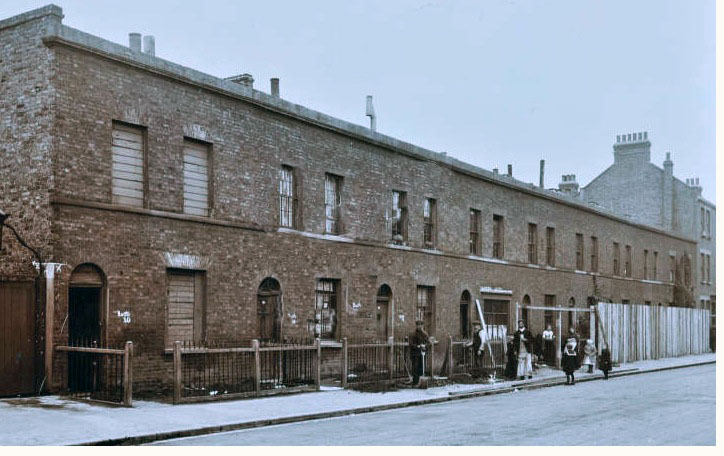 From looking at census information the addition of the terraced flats brought a more mixed class of people to the area, the remaining cottages housed the more wealthy while the terraced houses generally were home to more working class and lower middle class people. Professions included music teacher, decorator, milk carrier and nurse. A proportion of these households still had servants however. Shops at the north end came and went as did a pub called The Star which stood until early 1900 before being swept away. Reay Primary School was built in the early 1900’s and was originally a school for boys. The school was built on the site of shops to the north of the street and was once bordered by a block of stables belonging to the local rag and bone men at the corner of South Island Place. By 1910 most of the terraces of Hackford Road had been converted into flats which housed many music hall actors, actresses and vocalists. 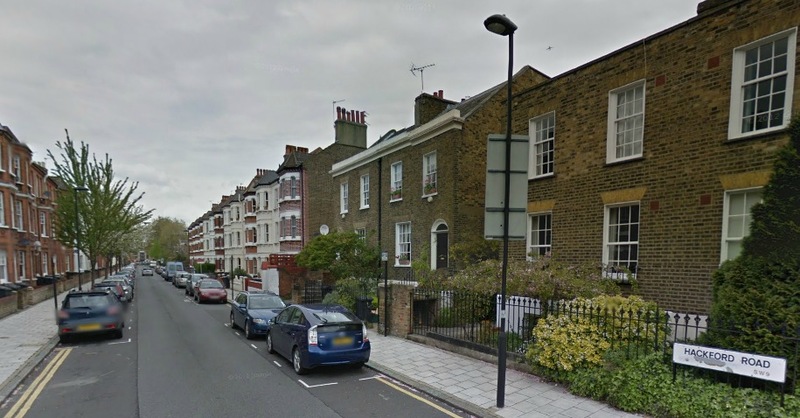 The area took on a liberal and younger feel, Hackford Road along with Morat Street and Cranworth Gardens even became known to house women working as prostitutes. The conservation area imposed strict building and alteration rules on this part of the street see here for the full guide to the Hackford Road conservation area. Hackford Road now stands as a mixture of housing styles, 1870’s terraces, 1840’s villas and 1950’s council blocks. At the southern end past Hillyard Street there is a large 1990’s residential block of houses and flats along with commericial units and the Type Museum. The map above is “Laurie and Whittle New Map of London with its Environs, almost all of the streets that we know so well had not yet been built including Hackford Road, the area was mostly open countryside. “Pigot & Co.’s Metropolitan Guide & Miniature Plan Of London from 1820″ shows the area eleven years later. 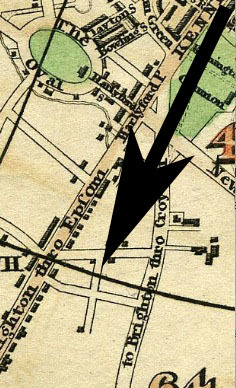 I have added an arrow pointing to the first appearance of Hackford Road on a map. Along with the surrounding streets it is unnamed at this point. It seems that Hackford Road began being built north to south. No buildings remain from the period. “Cary’s New Plan Of London And Its Vicinity” shows the area another twenty eight years later in 1837. 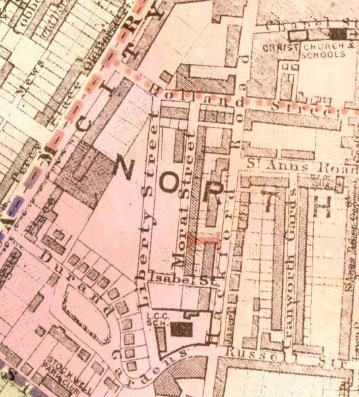 The unnamed shape on the map 17 years earlier now bears a name, St Ann’s Road, the original name for Hackford Road. Laurie’s Map of London shows Hackford Road 7 years on from the previous map. It is clear that many more houses have been added. The houses that you can see here on the right hand (east) side of the street still stand today. They are detatched houses of different architectural detail. The left (west) side was also a line of detached houses however they no longer stand. 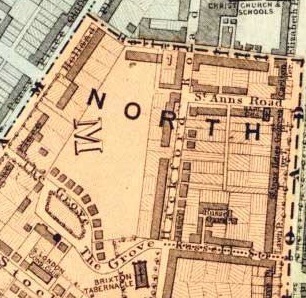 This is Cross’s New Plan of London 1861.Hackford Road is still called St Ann’s Road. 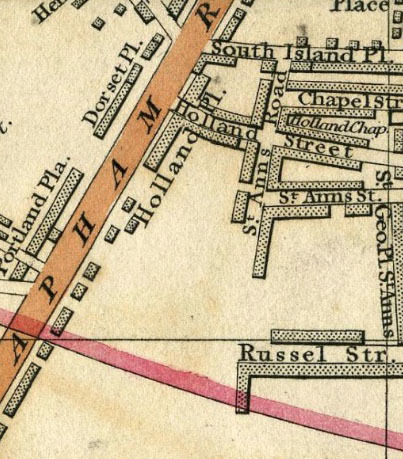 The map above is a Lambeth Ward Map from 1876 showing the division between the Vauxhall Ward (light blue) and the North Brixton Ward (pink) Hackford Road has lost the name St Ann’s Road and is now labelled with it’s modern name. 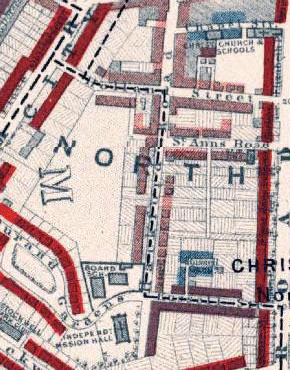 Charles Booth’s Map of London Poverty research took him to Hackford Road in 1895. 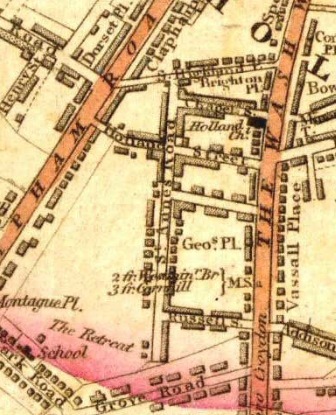 The Map above is from 1898 and shows how Booth graded the street. The key to what the colours mean can be seen to the right of the image. For more information on Charles Booth and the classification of poverty see here. 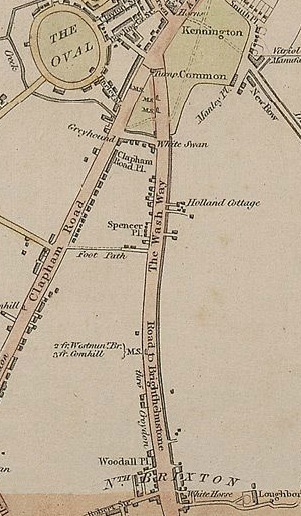 Hackford Road can be seen here on this 1918 Ward Map. It is remarkable to note how much the area has built up over the years, especially when scrolling up to the 1809 map when this entire space was empty. In September 1940 the government started to collect and collate information relating to damage sustained during bombing raids. Hackford Road emerged relatively unscathed in comparison to surrounding areas however it did take quite a few hits and sustained quite a bit of blast damage as you can see above. I will post more about Hackford Road in the wars over on ‘Our streets at war – A street by street guide’ shortly. The above image is roughly the same view as the 1910 photograph, not much has changed except the addition of cars, wheelie bins and garden walls. 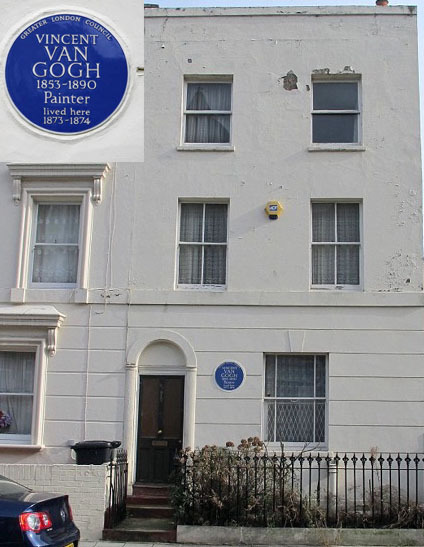 At the age of 20 Van Gogh arrived in London to start work at an art dealership in Southampton Street and from August of 1873 he lived in 73 Hackford Road. Van Gogh came to work in London for the art dealer Goupil & Cie in Covent Garden. He walked to and from work each day, with his career as an artist looming in the future. The house was owned by a Mrs Ursula Loyer, who lived there with her daughter. It was Mrs Loyer’s daughter Eugenie who Van Gogh reputedly first fell in love with. His love was documented in letters dotted with Keats’s poems of love and desire. His advances were however totally unrequited and he became obsessive and a nuisance to the quiet Miss Loyer. He was soon asked to leave and find new lodgings in Kennington. 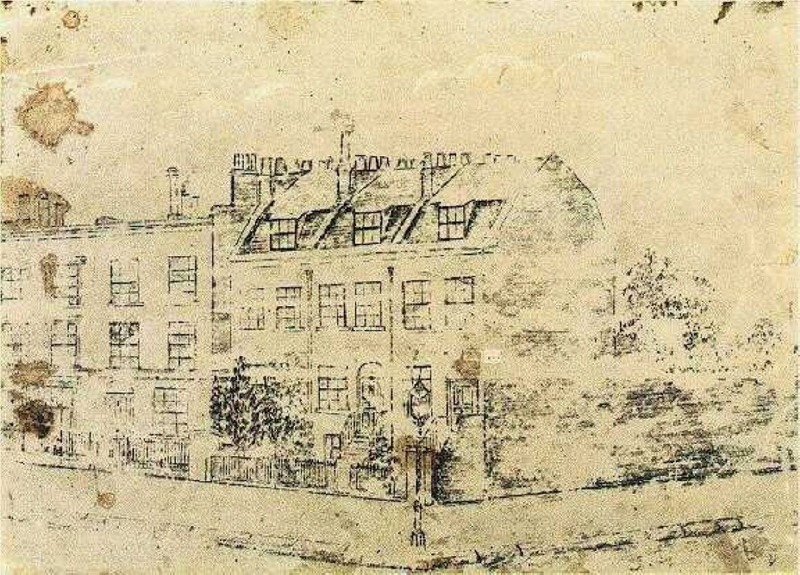 There is also a sketch of Hackford Road, shown below, which includes number 87, this was in the possession of Eugenie Loyer’s grand daughter, Mrs Kathleen Maynard, and it is now in the Van Gogh museum in Amsterdam. The Hackford Road sketch is the earliest surviving drawing from Vincent’s English period. What is now known today as Durand Academy was once two schools side by side, Kennington Secondary School and Durand Primary School. Roger Moore was a pupil at the primary school here in the 1930’s when it was known as Hackford Road Elementary. 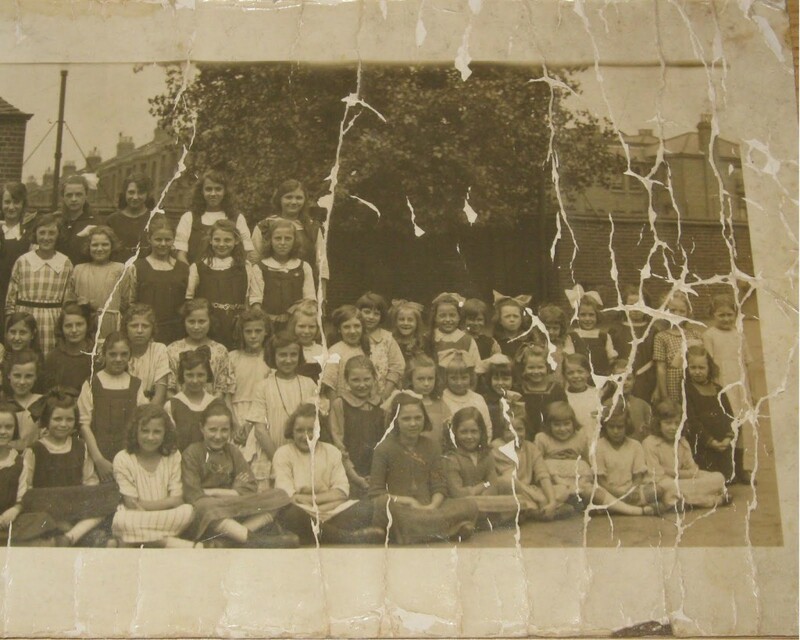 The above image is from Durand School in 1921 – it was found here. 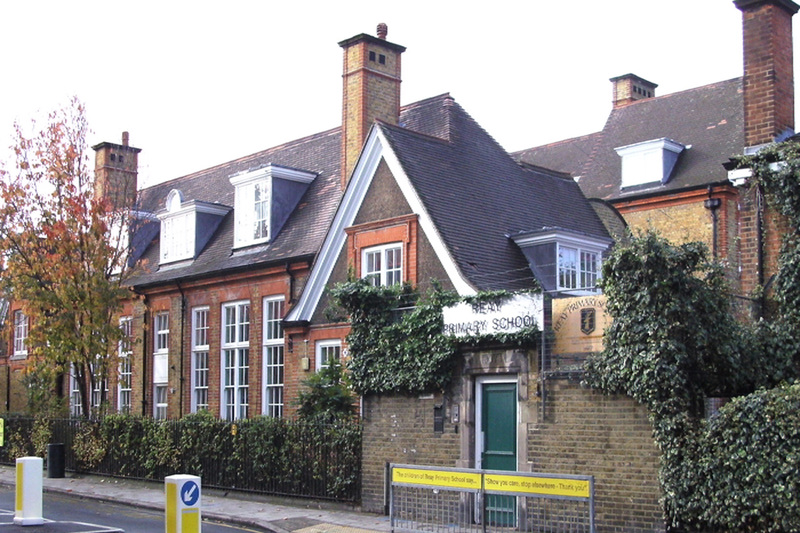 This school occupies a plain three-storey brick building which was built for the London School Board by H. Hart of Southwark, whose tender for a school for 996 children was for £10,249. The architect was T. J. Bailey and the date of opening was May 9, 1887. The south wing was added in 1894. This building adjoins Kennington Secondary School and was erected for the London School Board in 1888 as a Pupil Teachers’ School. The contractor was H. Hart of Southwark, whose tender was for £6,230. The architect was T. J. Bailey. The building was later used as a secondary school for girls, and a second floor was added in 1906, Bailey being the architect. The south wing was damaged in the war of 1939–45 and has since been rebuilt under the supervision of Mr. Richard Nickson. This large building was constructed in 1885 and whilst today it houses the Type Museum it was originally built for Mr Thomas Price’s veterinary practice and quarantine station, later known as Price & King’s. This large rectangular building was built with high ceilings and lofts, specially adapted to be able to house and treat large animals such as elephants and giraffes. 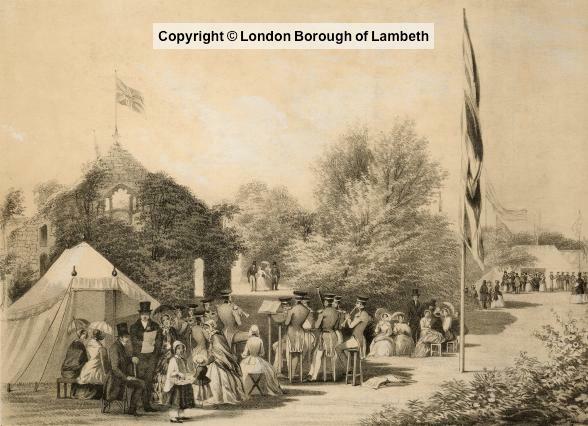 It was also one of London’s main quarantine stations for performing animals coming in from abroad, some at the time were very famous, such as The Great Lafayette’s lion. ‘It is not generally known that in Brixton is situated one of London’s most fashionable hotels. It is run by Messrs. Price and King exclusively for animals, and here one may meet quadrupeds with the bluest of blue blood in their veins, four footed actors and actresses and many other notables. (1) Lady Saza the human monkey, breakfasting in her private apartment. (2) Miss Ella and one of her lions. (3) Baby Jumbo and his valet pay a call on a zebra. 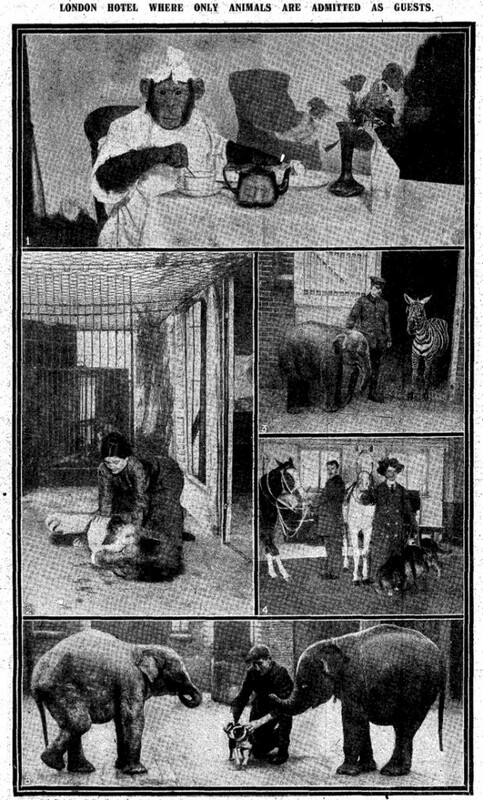 (4) Baroness Lutzell with her clever horses and dogs. (5) Hanky Panky, the well known actor, who appears in ‘Everywoman’ being groomed. Baby Jumbo and Baby Jimbo, The Daily Mirror elephants, now amongst the hotel’s distinguished guests, are looking on. Sadly on a few months prior to the above article and images on Sunday 24th March 1912 disaster struck and a terrible fire broke out – read more about it in the Hackford Road ‘In the news’ section here. Hackford Road boasts the world’s most significant typographic collection in the building that was once Price and King’s veterinary practice. 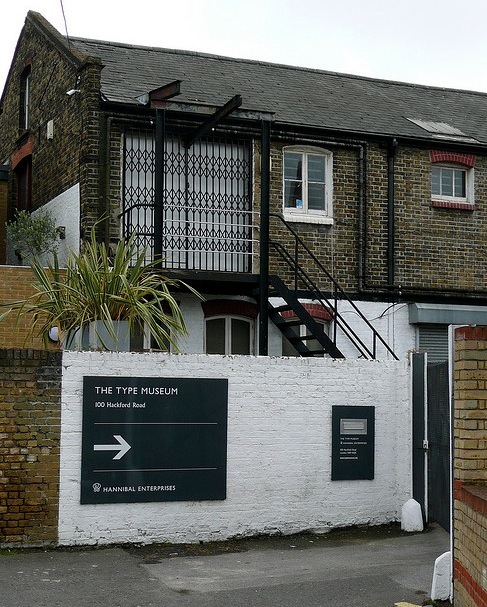 The site around the museum was Hackford Road’s industrial part, once housing a sausage making factory, a parking depot area for hackney cab’s and Pickford’s removals. The museum houses examples of the art and craft of typography from the last 500 years. More detail on the occupancy of this building here. I can remember Syd’s grocery shop which I think was very near Kennington Secondary School just on the opposite corner. It did a good trade with the kids from school. Just out of interest your post was on my 80th birthday. I also attendeded Kennington Secondary School but after you from 1956 until 1962. I do nt have any good nostalgic memories during my time there and do not think it gave its pupils a very good educatoin, perhaps it was better in your time there. I remember it as a rough and ready type of school where only a very basis education was taught. I suppopse the school just reflected the area in which it was located which was also a rough and ready area. I lived in nearby Hillyard Street and was very glad to leave the area.and I now live in rural North Devon. I have visited my daughter recently who also lives in Perth Western Australia and I think its a great place to live. I just happened to click on this sight having forgotten all about the post I made back in Nov last year. Low and behold I found you reply to that post. Good to hear from you and that you are living in North Devon, such a lovely place. My brother-law lives Biddeford where my wife and I have visited often in the past few years so we know the area quite well . You mentioned that your daughter live here in Perth, we live in Caversham which is at the edge of Perth. When I was at school at Kennington Secondary I don’t remember it being rough but was very strict. 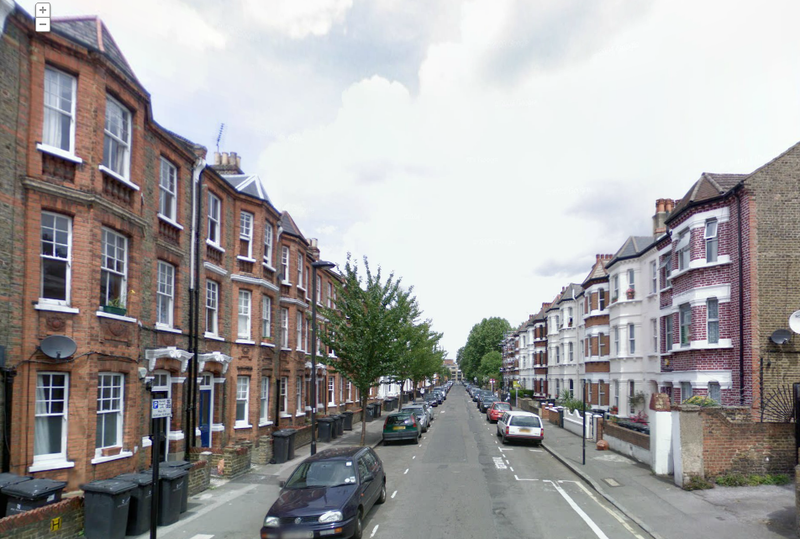 I lived in Dorset Road until I went into the army in 1953. My email address is charliew@iinet.net.au and would love to hear from you at anytime. 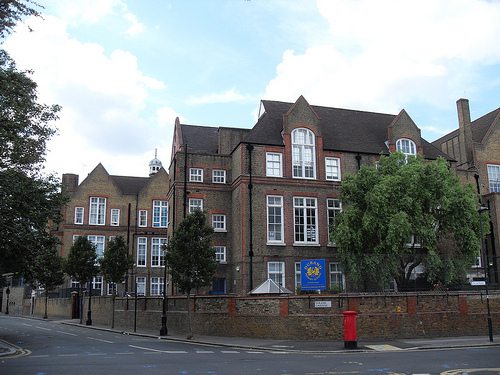 I attended Kennington Secondary School from 1951 to 1956. I remember both Mr Everitt the music teacher and Mr Daniels the Geography teacher. I also remember Faraday (red, I think) and Stevenson (yellow) house. Mr Daniels took us for football in Kennington Park. Mr Haley – History, very expressive. I used to walk down Hillyard St to school each day and remember that on the right hand side there were pre-fabs for the whole length of the road. We used to play cricket in the playground, and one day I was batting and took a swipe at the ball. The ball caught the edge of the bat and sailed over the very high fence and crashed through a window. An old lady started screaming, very embarrassing. Happy days!! I used to go to this school (circa 1962/3). The masters wore old style gowns and mortars. The only teacher I can recall clearly is Mr Gallagher. Only due to his infamous Gallagher punch to the back of the head! Other teachers who come to mind are the French teacher who wore his pants up to his arm pits and the brilliant music teacher Mr Beecham. Joshua Haley, the greatest history teacher that ever lived, at Ken.Sec. BOUDICCA and not BOADICEA he instilled in us. Googled him at Godalming Library in Surrey.He lived there.He died in 1975.A great man. Used to send me homework in the post during school hols, would you believe.My parents agreed to it, Of course, it wasn’t obligatory. And wanted it completed and posted back ASAP.Or else! They were all university men, unlike today’s rabble. You don’t say when you were at Kennington. I remember Josh very well. He got me through A level Brit Con and Economic history and with A level Geography ( courtesy of Mr Wilson’s teaching), I managed to get into university (Essex) in 1966. Without the brilliance of Mr Haley and the encouragement of other teachers ( Adamson, Masara et al ), I would never have achieved this. I am sorry I did not keep in touch with the school and certainly did not know that the world’s greatest history teacher had died in 1975. Hi Terry.i just read your post on the Hackford road sight and it brought back a load of memories.i seem to remember that you had a penchant for Tonik mohair suits,a different colour for each day of the week,lol.I also remember all those teachers,Haly,Adamson,Richie,Lovell,Massara aka bomber,Hot dog smith,Galleghar et al,quality teachers all.On a more personal note your dad used to drink with mine in the tap House in Larkhall Lane.Hope you’re keeping well as I am,retired in South Carolina. I went to Kennington Secondary during the 60’s, and largely have fond memories of my time there. Although I initially attended Hackford Road, I ended up at the Cormont Road annex. Although my academic achievements were very few, I did end up as School Captain. Being School Captain did instil in me a sense of responsibility, commitment and taught me early organisational skills which were to prove useful later in life. Mr Fawcett, headmaster who was always polite and charming, and invariably seem wearing his gown. I still have a dictionary I received as a school prize which bears his signature. Mr Haley, whose enthusiasm for history certainly rubbed off on me. I remember a day trip to Hampstead where we toured the old area looking at various historic connections. My other memory of him was as a strict disciplinarian, who was very free with use of the cane. Mr Turner, my very few, form master in the first year who was very adept at throwing the chalk duster as any inattentive pupil, and was also very skilful in the use of the slipper. Mr Heath, science master who had a large urn in the science lab in which he used to boil the water for the staff room. Mr Massara, language teacher. He too was very strict, and could often be heard shouting “that boy” to attract their attention. Mr Beech, who if memory serves correctly me was head of the ‘juniors’. Mr Stephenson, who I believed taught English. He was a kindly man, a little bit like ‘Godfrey’ from Dad’s Army. When I finally left school he sent me a telegram wishing me all the best in the future. Mr Gormley, who did metal work. His wife was Teresa Gormley MP. Messers Daniels and Gallagher come to mind, but just vaguely. The names of other teachers don’t readily come to mind. Pupils that I have fond memories of include Tony Heuer who was Head Prefect, and a life long friend until he passed away. Henry Curniffe, Vice School Captain, who I believe returned to the Caribbean to join the police force in his home country. As for me I ended up as a Forensic Manager with the Metropolitan Police, New Scotland Yard, before taking early retirement in 2007. I’m now a professional tourist! I must have been a couple of years ahead of you. I remember the teachers you name with extreme fondness and gratitude for what they did for me. Josh Haley managed to get me through two A levels (at good grades) and through Mr Wilson’s teaching I managed ( just about ) to pass A level Geography. With the three A levels I was accepted at Essex University and went there straight from Kennington in 1966. The school captain at that time was called Chavezco (Charlie) and the vice-captain was a chap called John Roberts. I believe that was the year that I left for university ( 1966 ) when John Adamson left for New Zealand. in a working class area. 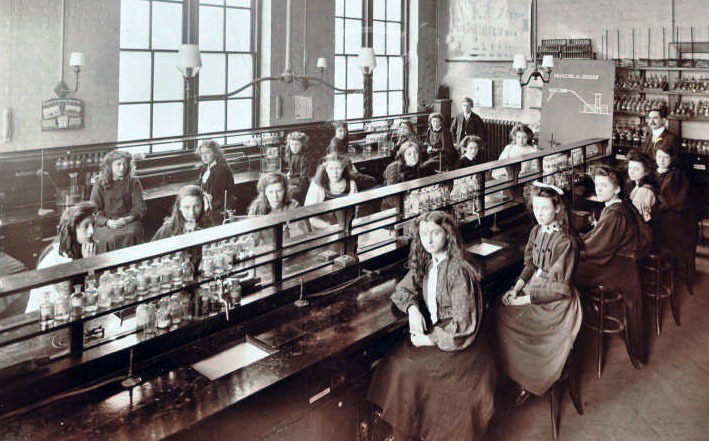 The dedication of most of the teachers was fantastic – there were exceptions who looked upon teaching as a job without any apparent motivation to see that their pupils reached full potential. But this was a problem in all secondary modern schools at that time. I was very fortunate to have had the great encouragement of Haley, Wilson, Massara, Adamson and a young temporary teacher called Harris who himself had attended the school some years before and had also obtained a degree from London University. He also left in 1966 after a brief spell of teaching in his old school. Oh well, a nice breakfast walk down memory lane. Best wishes and you just remember me. Apologies for the obvious errors in my message. Hi Tony – I was there up to 1962. I remember several of the teachers you named and in particular Mr. Turner. The chalk duster parted my hair a few times and who could forget his size ’16’ slippers! Mr. Massara French teacher. Mr. Beach, if I remember correctly, was my form teacher and also took Maths? The one everyone remembers, of course, is Mr. Haley, a true Lion. The corner shop opposite Hackford Rd boy’s school was where we could buy blue penny Lolly’s & large slabs of honeycomb. A treat to buy on Friday with pocket money. Hi lived on Hackford Road No.47 from very early 50s until aprox. early 60s . Three families in each house ,. Attended Durand , Ray Schools . Moved to Brixton Road Lambert Road , not the same . Know as Little Mick . Now live in South Yorkshire . Hi ,Bernard Brazil is my name . I attended Kenington school about 58 – 60 , I had come to London from Dublin in august of 58. I started in class 3t1 and I believe my house was faraday. My Irish accent was the cause for a lot of Micky taking, but my school mates were great and I was talking like a cockney in no time. I can remember Mr Adamson,his name the would be the one the pupils were told to find and ask for cane and book. I think the geography teacher was Welsh, he was also the sports teacher and when he held the boxing tournament you were not invited you told you would be taking part. The school had a great sport side to it. One name that comes to mind who done well in football was Lennie Glover, played for Charlton and then went to play for Leicester city . I remember marking him in a game down in Morden. We used to get bused out to Morden on Friday,but if it was too wet we would walk to Kennington park and play on the cinders. I had some great pals at that time , mesers Saunders and Baker, always up to no good, but in nice way. Bill Penston another skilful football player, Scot McGregor I do believe he had his blazers made to measure and John Moxon we got on well together well we where the only two West Ham fans in the class. Hallo Bern, came across this site by chance. Don’t suppose you remember me I was (one of the scruffy ones) with you in 3t1. I have a class photo taken about 1958 you are sat in the front row . I remember Bill Penston Spurs supporter Alan Palmer Arsenal me a Chelsea fan for ever!! After Hackford Road I went in the Royal Navy in 1961. Ended up in the 70’s bricklaying. The last twenty-six years been living in Germany. Dare Burridge I remember you but it’s a long time ago you lived in the last house of durand gdns I used to walk through the gdns on the way home to stockwell station we had moved to Morden. So you went in the RN ? I travelled the world living in Africa and the US in Los Angeles. I have 2 sons in the RN one was an commissioned in the Royal Marines the other is a Commander in the RN. As you guess I sent them to a different type of school to Kennington. I hope you are well in Germany I now live in Devon ! I went to Kennington Secondary in 1956 having failed the 11-plus, but made better progress thereafter before leaving in 1961 for Norwood Technical College and A-levels. Among the teachers I well remember the “Josh” Haley, “Emily” Emmerson, “Adolf” Adamson and “Charlie” Robins. Like the others who have commented Haley was an amazing History teacher – he stood there and the words just flowed out without the aid of any notes. On one occasion he had reason to quote from King Lear with “Out vile jellies!” – probably just to shock us. Robins was the Maths teacher who revealed the beauty of the subject to me. He could also speak fluent French when required. He had one finger missing. Massara was the one, if my memory is not deceiving me, who had his trousers up to his armpits. I think his nickname was “BOMDAS” rather than “bomber” because he was very enthusiastic about “Brackets Of Multiplication, Division And Subtraction” and the consequent mnemonic. Francis Steptoe (really!) was the Music teacher who, willingly, fostered my growing interest in classical music. Mr. Heath was useless as a Science teacher whilst, at the Wyvil Road annex we had Science teacher Mr. Roberts who was wonderful. An ex-RAF pilot who carried the burns of a crash from his flying days. Less prominently we had the Art teacher Mr Jackson (occasionally referred to as “Jacko” by his less discrete colleagues) who carried a slight speech defect and Mr Terry who took us for Technical Drawing in the little building in the playground. Infuriatingly I cannot remember the names of the two woodwork teachers but I still have a stool, money box and small bookcase I made under their instruction. Like others I stubble on this site, nice to see there’s some off us still about! From what I can remember I was at KCSS from 1958 to 1962, in classes 1E, 2E, 3T1 (at Cormont) and 4G1. Class mates I remember were Howard Nobbs, Ron Grimond, John Walker, Anthony Schcaire (the first coloured boy in the school) Jack Thrip, Charlie Simson, Ian Homes, Michael Hubbard, Harry Rushworth, now I’ve run out of their first names, so others were lads call Walsh, Green & Greener, Perry, Petite (he got me caned by the head master and my name put in the punishment book!) & Dowset. Teaches I remember fondly were Mr Hales for making history very interesting and H.D.Smith (known at hot dog) for caning us all at the beginning of each lesson! I was at Kennington Secondary from Sept 1951 to July 1956 and it’s great to hear the memories on all of the postings. The name of Josh Haley comes up a lot and I’ll echo all the wonderful things that have been said about him – he was brilliant and full of enthusiasm. In 1953 Josh and Rex Gloster (PE and games) took a party of about 15 of us to the Lake District for two weeks staying in a hostel at Newlands nr. Keswick. They were both great company and it was all very relaxed which kickstarted my lifelong love of the Lakes. There talk of a pillow fight against another school planned for one night and Mr Gloster stayed up all night sitting on a chair in the corridor to prevent it taking place. That was dedication to duty! An earlier posting mentioned the four houses – Churchill, Faraday, Stevenson ……and the one he couldn’t remember was Alexander (green) and that was my house. There was another successful footballer who went to the school and that was Alan Dicks who played for Chelsea (reserves mostly) and then went on to manage Bristol City. I was a ball boy at Chelsea from 1953 to 1956 and the few midweek games they had were often a problem as they were played in the afternoon (no lights in those days). I’m ashamed to say I’d often have a severe stomach ache/cold/sickness on those afternoons. It still beats me as to how I got away with it every time! Mr Brown our English teacher was another really good bloke and I even wrote to him after I’d left school in 1956 as I’d heard he was retiring. True to form, he wrote back. Someone mentioned the Welshman Mr Daniels who also took games and, I believe, played rugby for London Welsh to a pretty good standard. He’d often take the school football matches on a Saturday morning which was very noble of him. He did have a fiery temper though which he displayed at the annual Sports Day in Kennington Park one year when some poor boy dropped the shot on his foot. The woodwork teachers in my day were Mr Fisher and Mr Oliver. I was very cheeky to Mr Fisher one day and he threw me , literally, down the stairs whilst shouting “get out you snotty little sod, and don’t come back”. I couldn’t complain though, it was my own fault. I don’t think for one moment that anyone will remember me. I attended Kennington Secondary School from 60 to 65 when I left, aged 16, to work in a firm of solicitors. I rember Rodney Waters, in my last year at the school. The teachers were all dedicated and although some were a little eccentric, or odd, they did a good job. 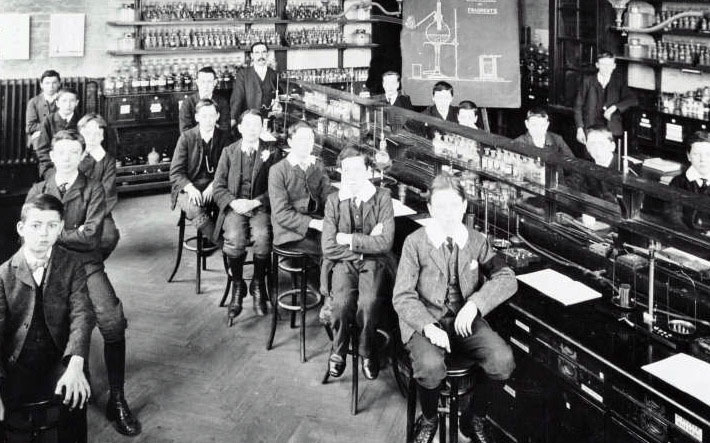 Compared to the quality of teaching these days I think we were pretty lucky.